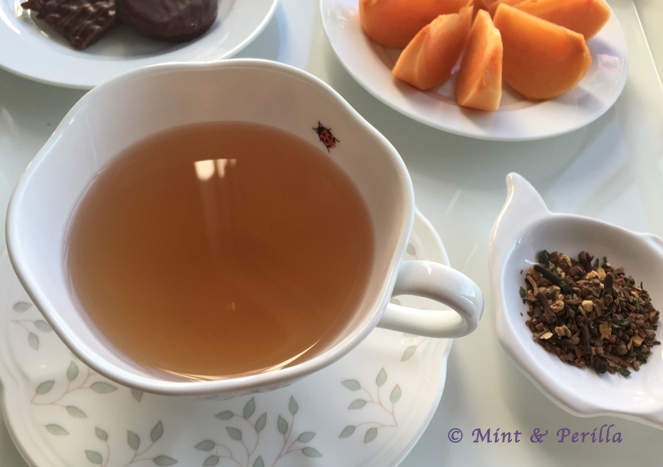 For my afternoon tea, I picked Yoga Tea from Capital Teas. I received it as a sample in my last order, which was lucky because I would never have bought this for myself. I think the sample packaging is the best of the brands I am familiar with. It is resealable and has a clear side, revealing the contents. Step up your sample game Teavana! 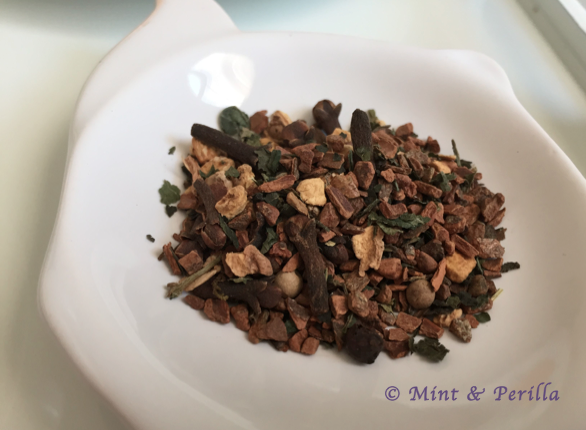 The amazing healthful combination of Hawthorn leaves, cloves, cinnamon and ginger along with a dash of pepper for good measure ensures you will have flavor galore in this herbal blend. Since the 1st century, Hawthorn has been used medicinally for heart disease and high blood pressure. 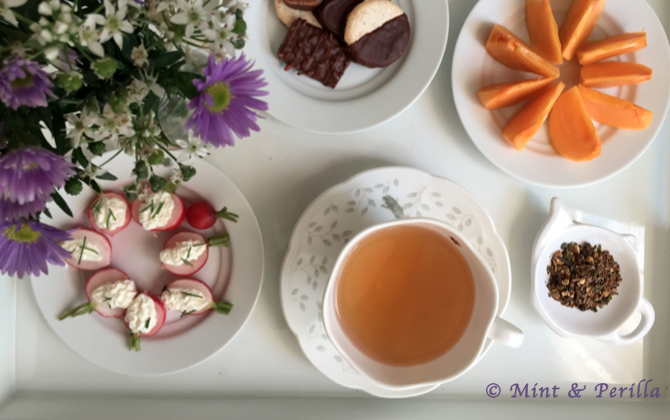 Drinking Yoga tea and a healthy yoga practice can do wonders for all aspects of well-being. From my readings (Rigelsky and Sweet. Amer. J Health-System Pharm. 2002;59(5):417-422), it seems Hawthorne is quite good for heart disease. Flavonoids found in the leaves, stems, and berries may be responsible for its beneficial effects in congestive heart failure. I read another paper that said it may lower oxidized low-density lipoproteins (responsible for initiating atherosclerosis). A heart healthy blend indeed. This tea was like a packet of Christmas spices. Cinnamon, cardamom, cloves. I'm sure adding milk and sugar to this would make it a perfect holiday treat. The cloves and cardamom are the most prominent. There are a bunch of ginger bits in here but I think the flavor is slightly overwhelmed by the cardamom and cloves. I really like the white peppercorns, it gives a fun kick to this blend. I do think this tea would be great for anyone feeling under the weather since it has such warm and comforting spices. I am glad I got to sample this, because I will probably purchase it in the future. My favorite things about the tea are the peppercorns and the ginger bits. 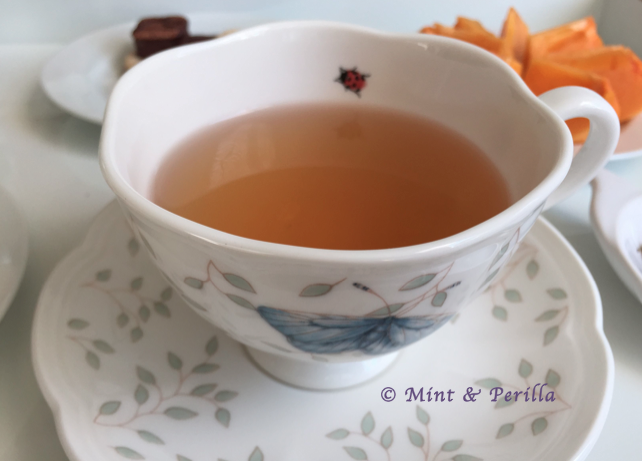 My guests seem to like spiced teas in general so this will probably be popular at my tea parties too. 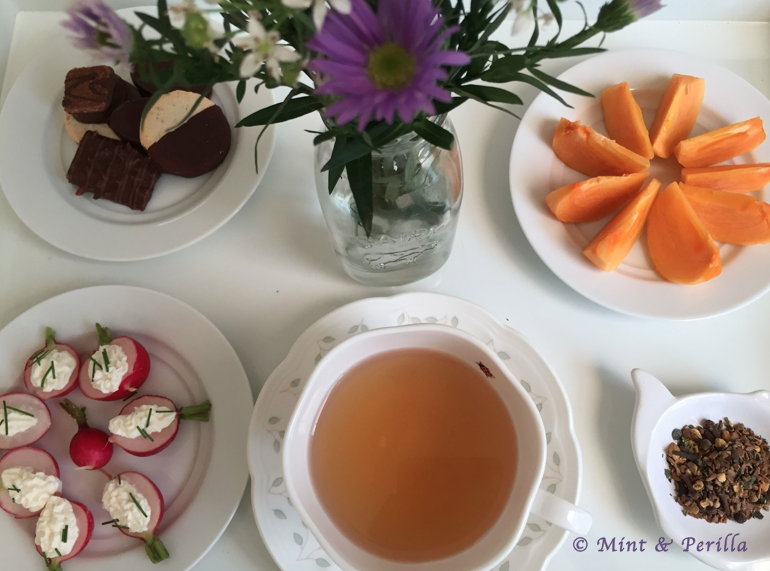 The fruit on the top right of my tea tray are persimmons. I'm filling up on persimmons now that they are in season. At the bottom left we have radishes with whipped cream cheese and chives. Not only are they cute, they are high in vitamin C and calcium. Did you guess what the white flowers were? Chinese chive blossoms! My mom gave me these chives to eat but I let them grow instead. Aren't the blossoms adorable? What to Bring to the Office Potluck: Fruit Cups! !